SolarCity pops, SunPower presents the future, and LDK Solar reports another loss. This week was full of fireworks in the solar industry. SunPower (NASDAQ:SPWR) released 2013 guidance, SolarCity (NASDAQ:SCTY.DL) got a big financing deal, and LDK Solar (NASDAQOTH:LDKYQ) finally released 2012 earnings. Best of all for investors, most solar stocks moved significantly higher this week. Here are the highlights from this week in solar. During an analyst day on Wednesday, SunPower released second quarter and full-year 2013 guidance, as promised (the full presentation can be found here). Here's what management sees going forward. If SunPower can report a GAAP profit for 2013, it would be a major milestone for the company. First Solar (NASDAQ:FSLR) is the only other major manufacturer making a profit right now, and SunPower has been posting losses for years as the industry struggled with oversupply. One of the drivers of higher installations and growing profitability is the leasing business, where SunPower competes with SolarCity. So far, it has installed 100 MW of residential solar with contracted payments of $541 million. To put this into perspective, this compares with 333 MW installed by SolarCity and $1.22 billion of contracted payments. I'll get into what this means in a moment. One interesting data point: In California, the average customer is paying SunPower $0.18 per kilowatt-hr for electricity, with a 1% escalator. This is after accounting for the investment tax credit, but it gives an idea how inexpensive solar power has become. 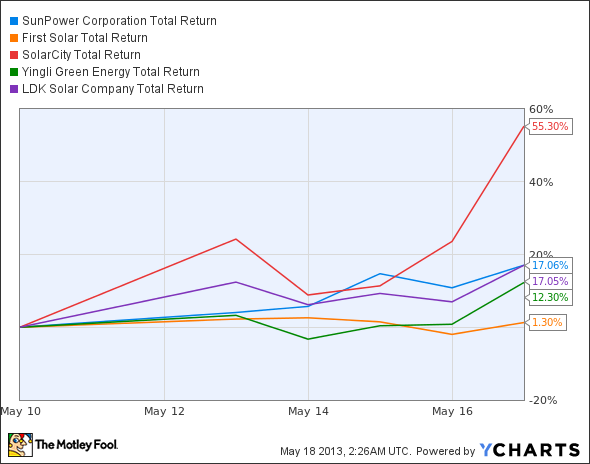 The huge winner this week was SolarCity, the residential and commercial solar installer. The company announced a $500 million financing agreement with Goldman Sachs, and suddenly investors flooded into the stock. This is really business as usual for SolarCity and will finance 110 MW of the 250 MW the company plans to install this year. As installations grow, so will revenue and net income because the leasing business is recurring in nature. The big difference between SolarCity and SunPower is that SolarCity does all of the legwork itself, and SunPower relies on dealers to find and install deals. There was also an interesting data point between the two companies. In its presentation on Wednesday, SunPower predicted $1.75 per watt in retained value, or the present value of future profits. SolarCity said it has $1.25 per watt in retained value. SunPower's number is a more recent data point, but it could point to the main difference in the two companies. SunPower is installing more efficient panels in its leases than SolarCity and theoretically has panels that will last longer because of higher quality, based on third-party testing. If both of these things are true, SunPower will generate more income from each project. What the management of both companies wants investors to do is assume that installations annually times retained value is a direct addition to the companies' value. So SolarCity will add $312.5 million (250 MW x $1.25/MW) in value this year, while SunPower will add $166.3 million to $192.5 million (95-110 MW x $1.75/MW) in value this year. That's the hypothetical value, at least. It will take time to determine whether SunPower or SolarCity is more efficient in building a leasing network, but there's plenty of room in the market for both, so it's just a question of who will operate more efficiently. Today, all we have to go off are projections, and the income statement will tell the true winner over time. Suntech Power (NASDAQOTH:STPFQ) did it again. The company couldn't pay its debts due on March 15, so it delayed payment two months, which 60% of holders approved. On Wednesday the company was supposed to pay $541 million of bonds, but it again didn't have the money, and it will delay payment until June 28. This time, Suntech just said a majority of noteholders agreed to the new forbearance agreement, but no one should be happy about this. Over at LDK Solar, management finally released fourth-quarter 2012 results, and they weren't good. Sales were just $135.9 million, and shipments were 184.7 MW of wafers and 69.1 MW of cells and modules in the fourth quarter. All told, the company lost $541.7 million in the quarter and $1.05 billion during 2012. LDK and Suntech are in similar positions, with billions of dollars of debt and little cash flow to pay for it. LDK "partially defaulted" on convertible notes in April, and there's no feasible way either company can pay back debt without a bailout from the Chinese government.